The guest speaker, Prof. David Adamu Baike, a former vice-chancellor of the University of Benin, said Nigeria needs drastic change in a positive direction to drive economic activities. He said that a well organised transport system of a country could easily be the life-wire of that country, as is being experienced in Ethiopia. He, however, lamented that Nigeria with its multifarious endowments in transportation facilities remained the most disorganised and the most wasteful system in place. Baike noted that people must be held accountable for actions, while the system would require responsible leaders who should be dedicated to the course of the industry for progress. “No one has been held accountable for the disgraceful demise of the Nigeria Railways, Nigeria Airways and the prestigious shipping lines that pilled between Lagos and Southampton and or Liverpool. “The crux of the matter is that we do not have an integrated policy on transportation system in the country and these accounts for chaos that is characteristic of our experiences while travelling within the country. “The transport industry in Nigeria is in a desperate situation. It will require a committed leadership that will be prepared to make sacrifices that will bail the industry from its present morass,” he said. Chairman of the occasion, Barrister Margaret Orakwusi, said leadership in the industry should be backed with appropriate legal and regulatory framework that should cause board members to be appointed justifiably. She said the leadership must show ability to carry out its function with zero tolerance for corruption, which had been a bane of development in the industry. At the panel discussion, Barr. Emeka Akabogu called for a leadership with focus on driving set agenda and achieving goals, not just going about routine works, signing of contracts. He charged the transportation minister to define Nigeria’s transport policy, have operational standard and ensure that the agencies under the ministry performed their key roles to develop and grow the sector. An industry expert, Otunba Kunle Folarin, proposed a realignment of the transportation sector in line with a national transport policy. He said each of the agencies under the ministry require master plans to enable them function with a focus, adding that Nigeria needs an integrated transport system to support its economic agenda. In his contribution, Barr. Alban Igwe called for a transportation policy and the need to make available a document that would encourage prospective investors to the sector. He said the draft policy on transportation needs a review, in order to give the industry the required direction, while professionalism should be given a priority in the running of the industry. The event Convener, Mr Kingsley Anaroke, said the issue of a national transport policy should be top on the agenda to engender the desired position for Nigeria’s transportation system. Anaroke said the draft policy on transportation had been abandoned since 2003, therefore leaving the industry without a clear-cut direction to follow. 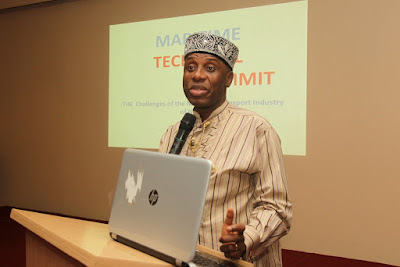 He urged the transportation minister to raise and work with technical committees that have the wherewithal to address the issues plaguing the industry. Highlight of the event was the award presentation of the ‘Best Maritime Agency of the Year 2015’ to the Nigerian Shippers’ Council.